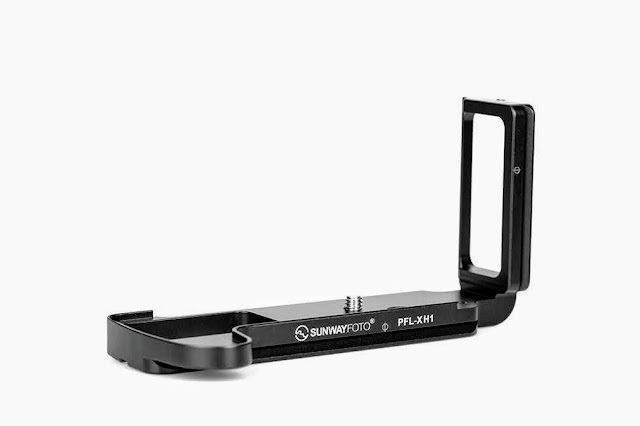 A little after two months from the release of the PCL-6D Custom L Bracket for Canon EOS 6D Body, Sunwayfoto has announced earlier today their Custom L bracket specifically designed for the Canon EOS 6D equipped with Battery Grip. Following the design of the also recent PCL-5DIIIG L Bracket for Canon EOS 5D MkIII with Battery Grip, the new PCL-5DG differs from its siblings the PC-6D Plate and the PCL-6D L Bracket. 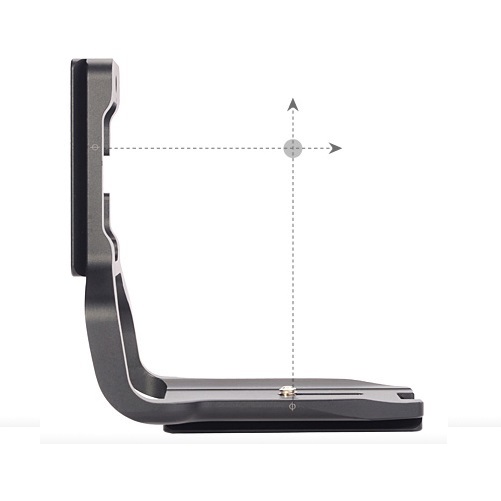 The new and larger L bracket is not a Skeleton type but rather a Hollow-Out type, which in my opinion offers a more rigid platform for the elongated vertical side. 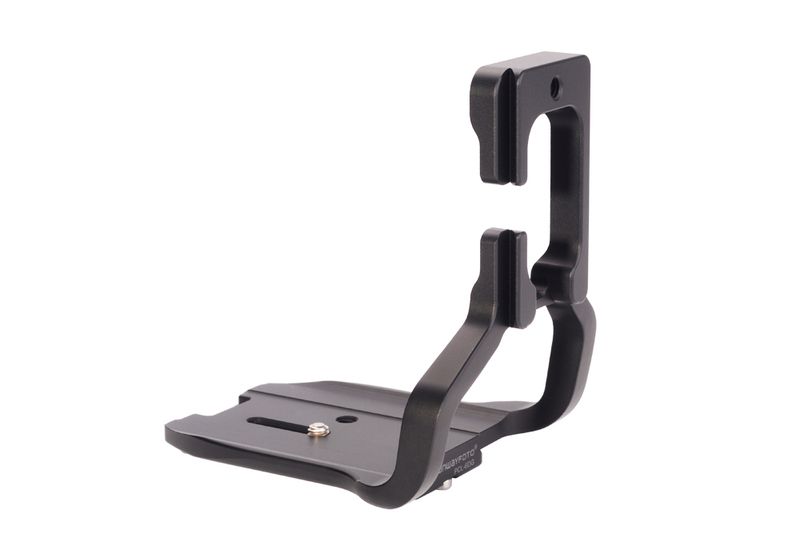 PCL-6DG L bracket is precision CNC machined from aircraft-grade aluminium with high quality surface anodizing. As illustrated on the right photo, lens centering Φ marks exist on the horizontal and vertical plain. 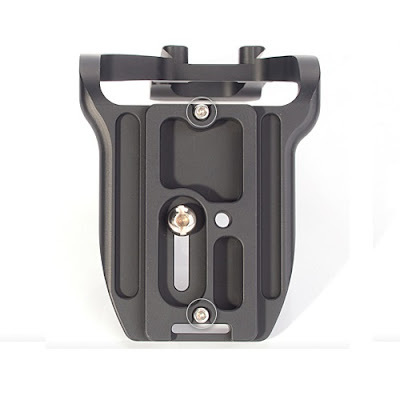 The vertical plate is braced to the massive looking base plate with two wider bars than its PCL-6D sibling which is intended for use without a battery grip. Convex edges both at the front and the back sides of the base plate prevent it from twisting. However, beside the looks, the L bracket weighs only 139 gr ! 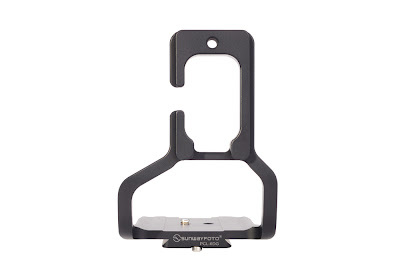 The vertical plate is placed in an offset position in relation to the base plate in order to give full access to the camera side connectors. 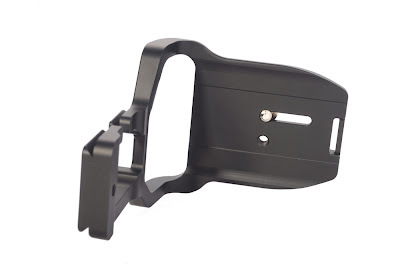 A gap in the dovetail on the vertical side of the bracket permits the use of a remote release cord without a need for removing the bracket, while the large opening below the plate permits the unobstructed access to the battery drawer of the grip. There is no provision for M3 safety stop screws on the vertical plate for security when in portrait orientation. 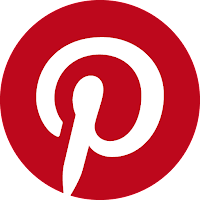 On the other hand there is one 1/4"-20 threaded hole at the uppermost part of the plate for direct mounting on a pod with an 1/4"-20 stud. However it seems to me very offset for the purpose. Looking at the base plate from top, we can see that the 1/4"-20 base mounting screw lies within a slot which will permit sliding the vertical bracket further away from the camera side, so longer plugs for e.g. tethered shooting can be used. The flat and smooth base enables a smoother slide out when the user will want to insert longer plugs in the side connectors and shoot in tethered mode for example. The bottom side reveals the Arca Swiss® compatible dovetail, two M3 safety stop screws at the edges and an extra 1/4"-20 threaded hole for use on a pod without removing the plate. 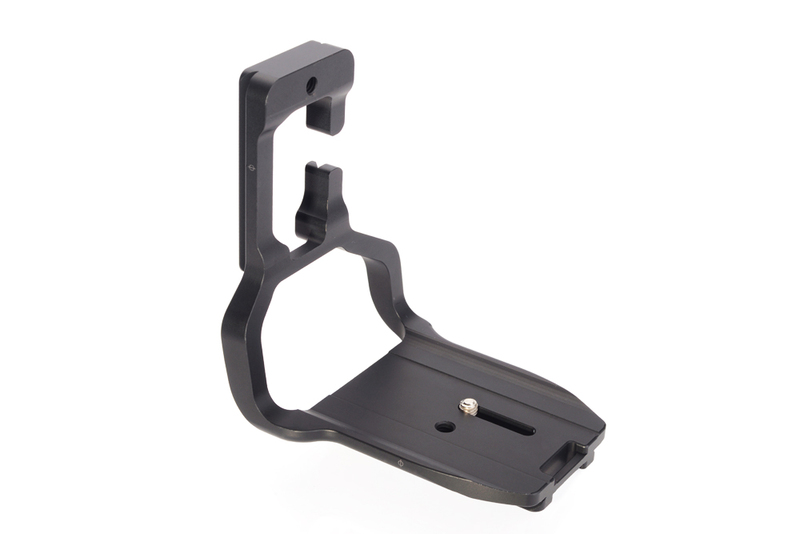 Following the hollow-out design of the PCL-5DIIIG, any excess material has been removed from the PCL-6DG L bracket, in order to minimize weight, just a step from being a skeleton design as its PC-6D and PCL-6D siblings. As mentioned above a slim film of metal is left in order to provide a smoother contact with the camera battery grip base. The package except for the PCL-6DG L bracket, will include also 2 x M3 safety stop screws, 1 x 1/4"-20 captive screw and 2 x Allen wrenches for the M3 and 1/4"-20 screws respectively. The estimated retail price for PCL-6DG is US$ 128.00 (+Shipping where applicable) and will be available in the market by next month. Nevertheless the it is still available from eBay worldwide.